$100, $65, $45, $30, $15. Additional fees may apply. 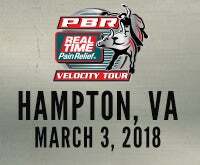 The PBR Real Time Pain Relief Velocity Tour is the top expansion series of the PBR. from the world leader in the sport of bull riding.